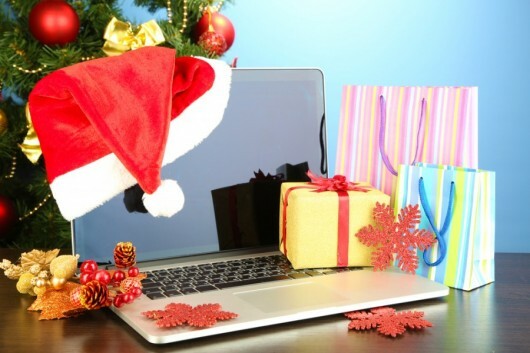 The holiday season is officially upon us, and many businesses are gearing up their online marketing efforts in order to take advantage of the enormous number of online customers who are about to log on. Even if your business doesn’t actually sell products customers want to buy as gifts for friends and loved ones, you can still leverage this very busy online shopping season. First, some stats. In case you haven’t heard, mobile is everything. According to Adobe’s Digital Index 2015 Holiday Shopping Predictions, this year’s online sales will see a 12% year over year increase, climbing to a record $3 billion in one day (Thanksgiving). Of those online shopping visits, according to Adobe, 51% will happen on mobile. This marks the first time ever that the majority of those visits are mobile browser based. This is huge! Apparently, many of us will be browsing online deals while sharing a meal with our families on Thanksgiving Day. Adobe is also predicting that online shoppers will have the best chance of finding discounts this holiday season via display ads and on social media. Note, display ads, not search! 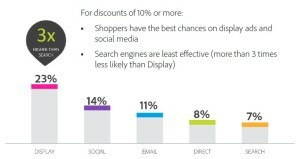 In fact, the best discounts on display are 3x higher than the deals found via search. Very interesting! Blog Your Way Into Their Hearts: Offer seasonal related articles on your blog, perhaps shopping tips, highlight products that you or your company offer or endorse that are related to the holiday season, or even offer suggestions on how to entertain during this holiday season. If your business isn’t selling the kind of products or services that are traditionally “holiday”, don’t worry. Linking your business to holiday related activities isn’t as hard as you think, and this is an opportunity for you to reach a big audience and gain a new group of followers. Make sure your keywords and metatags are optimized to reach the right audience! More Display: If you have a big search budget and aren’t doing much display, this would be the time to rethink your strategy. Visual ads are going to capture online shoppers more effectively than the typical search ad. Shuffle some of that money from search to display and make sure you have a compelling, call to action offer. Get Social: Social media is a great way to reach out. Especially if your site isn’t optimized for mobile, social is an easy, quick and nimble answer. Run a contest to win a gift card, in exchange ask for a like and an email address, and pick a random winner. Again, if a gift card for a product at your business doesn’t make sense, then offer a credit card type gift card they can use for anything they want. Who wouldn’t want some additional holiday funds? And now you are growing your social audience, gaining new email addresses and promoting good will by posting and congratulating your winner. Everybody wins! If you need a strategy for capitalizing on the big opportunities the millions of online shoppers can offer you and your business, contact the team at g2 media pros.